JOHOR BARU: Escalating prices of building materials, higher manpower costs due to shortage of labour as well as hidden costs are among the main concerns of property developers in Johor. Ku Hwa Seng says infrastructure projects outlined in 10MP and Budget 2011 would further push up prices of building materials and labour costs in the next five years. Property Man of the Year 2010 Datuk Alan Tong Kok Mau (holding trophy), group chairman of Bukit Kiara Properties, sharing a light moment with Yang di-Pertuan Agong Tuanku Mizan Zainal Abidin. Looking on are organising chairman Datuk Robin Tan Yeong Ching (left) and FIABCI Malaysia president Yeow Thit Sang (right). 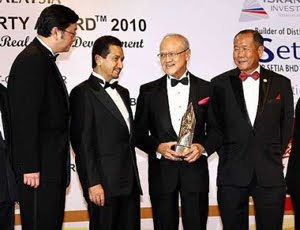 PETALING JAYA: It was a glittering and memorable night last Thursday when the best of the country’s property developers were honoured at the Malaysia Property Award 2010. Amid the glitz and glamour of the event was a strong message to property developers that profits aside, going “green” is not only the way forward but also will be the future demand for residential and commercial properties globally, including in Malaysia. The two most-talked-about issues were sustainable property developments and caring for the environment. The highlight of the night was centred on the winner of the “Property Man of the Year Award 2010” Datuk Alan Tong, who is also dubbed Malaysia’s Condo King. “Winning this award is an acknowledgment by the panel of judges that hardwork pays. As a property developer, I believe that being diligent, transparent and having consideration for property purchasers are the most important traits of any good developer,” he said. Tong received the prestigious award from the Yang di-Pertuan Agong Tuanku Mizan Zainal Abidin, who graced the event at The Shangri-La Hotel in Kuala Lumpur in a glittering ceremony attended by local and foreign guests. 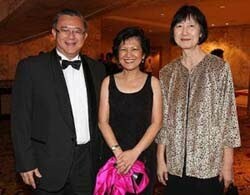 From left: See Hoy Chan Holdings group director Datuk Teo Chiang Kok, Star Publications (M) Bhd group managing director and chief executive officer Datin Linda Ngiam and Malaysia Property Award 2010 judge Datuk Ng Poh Tip. The nine other winners of the Malaysia Property Award 2010 included Sunway City Bhd’s Sunway City Ipoh for the Master Plan category; Coronation Springs Sdn Bhd’s Springtide Residences in Tanjung Bungah, Penang (Residential Development – High Rise); SP Setia Bhd’s Precinct 3, Setia Eco Park in Shah Alam, Selangor (Residential Development – Low Rise); Sunway Pyramid Shopping Mall Expansion in Bandar Sunway, Selangor (Retail Development); and Quill group’s Quill 7 in KL Sentral, Kuala Lumpur (Office Development). The other winners are The Westin Langkawi Resort & Spa, Langkawi, Kedah (Hotel Development); Cahaya Jauhar Sdn Bhd’s Kota Iskandar (Phase 1) in Nusajaya, Johor (Public Sector); Gloharta (M) Sdn Bhd’s Bunga Raya Island Resort & Spa in Kota Kinabalu, Sabah (Resort Development) and Gamuda Bhd’s Stormwater Management and Road Tunnel (SMART) (Special Award for National Contribution). 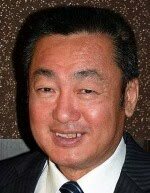 SunCity property investment managing director Ngeow Voon Yean said bagging two awards in the FIABCI Malaysia Property Award 2010 was a recognistion of all the hardwork and dedication of the Sunway Group staff. Quill group executive director Datuk Michael Ong said: “We are delighted to have won the award. It has been a long journey for us,” he said. The property developer won the award for its magnificent 30-storey office tower set in the heart of KL Sentral, Malaysia’s largest transit hub – QUILL 7. The International Prix d’Excellence is an annual competition which honours the world’s best property projects. The 2010 Malaysia Property Award was organised by FIABCI Malaysia with Malayan Banking Bhd as the official sponsor. MELATI Ehsan Holdings Bhd is on the lookout to buy more land to develop a range of mix property development including condominiums and shoplots. Its sales and marketing manager Tan Lai Huat said the company is scouting for land in not so prime areas in the Klang Valley. "Unlike other developers, our target market is for a different segment of people. Hence, we go and look for land in not so prime areas as we feel that we can cater to a different market," Tan said at the launch of the show units of Laman Bayu in Kota Damansara yesterday. Melati Ehsan has so far completed eight projects in Kota Damansara, which were mainly residential areas like semi-detached homes and bungalows. Besides Laman Bayu, it is also developing a project in Kota Damansara comprising 90 terrace houses and 12 semi-detached units. It will be completed by the end of next year. The company also plans to launch a new project at Bukit Tengku in Section U10 in Shah Alam, Selangor comprising 133 units of two-storey bungalows to be priced between RM5 million and RM6 million each. "Although there has been some revisions towards the bank loan whereby third homeowners are only allowed loans up to 70 per cent of the amount, we believe it will not affect the sales of our new projects as most of the buyers for our projects are upgraded young families," Tan said. It is a bit of a coup for Mulpha Australia Ltd to have come to own Hayman Island, located off the east coast of Queensland in the Whitsunday Island group in Australia. Of these group of islands, Hayman is closest to the Great Barrier Reef and is made up of a lush green sub-tropical forest. The island has an award-winning resort, simply called Hayman and is also owned and operated by Mulpha Australia. Hayman is marketed as a private island destination, considering that it is the only resort on the island and will remain so, and seems to cater to the well-heeled. For example, Hayman’s soon-to-be-launched private beach villas, which will boast dedicated butlers and a private pool, are being offered at whopping A$1,350 per night. Bookings for the first month are close to be fully taken up, says Shane Green, the resort’s general manager. Mulpha Australia (a wholly-owned unit of Mulpha International Bhd) bought Hayman in 2004 as part of a portfolio of hotels offered by the Principal Hotel Group. Green, who came on board in July, says plans are under way at “taking Hayman to the next level” by reinvesting money to upgrade current facilities at the resort. “We’re looking at giving the visitor a new level of experience, with a focus on the spa and relaxation, a sort of re-imagination of Hayman if you like,” he says. Green is quick to add the changes would make use of the existing infrastructure of Hayman and that the refurbishment work would be completed in 24 months. According to Lloyd Donaldson, the head of hotel investment for Mulpha Australia, the company is investing between A$20mil (RM62mil) and A$30mil into Hayman, of which A$5mil has already been mostly spent on the eight new beach villas which are coming onstream on Dec 10 this year. Hayman has 212 rooms, consisting of suites, penthouses and beach villas. More importantly, Mulpha Australia has secured the necessary approvals for building 42 private homes on Hayman. To be noted is that about 75% of the island is made up of a national park and so cannot be developed. Hence, the 42 homes carry a sort of exclusivity premium. Adding that to the fact that these homes will have wide oceanic views, it’s no wonder these houses are being priced between A$15mil and A$20mil. So far, three such houses have been sold and few more are close to being sold. The first house is about to be delivered to its new owner. Green, an experienced hotelier, whose last postings were in the United States where he oversaw the development of major resorts and upscale residential projects in Los Angeles, Miami and Las Vegas, said that to ensure consistency of design and aesthetics, all the homes to be built on the island will have to be designed by the Kerry Hill architectural firm. Kerry Hill is also the designer of Hayman’s new beach villas and also of Mulpha International’s planned luxurious bungalows in Bukit Tunku, Kuala Lumpur.